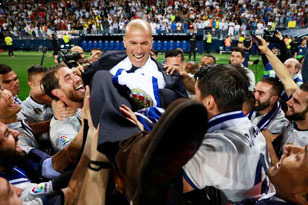 Madrid, May 22: Real Madrid were crowned the Liga Santander Champions following a 2-0 win over Malaga while Villarreal and Real Sociedad have qualified for the Europa league. The result on Sunday night means that the club has won its first domestic league title since 2012, putting an end to a five year drought in which FC Barcelona have lifted the title on three occasions and Atletico Madrid once, reports Xinhua news agency. Zinedine Zidane’s side travelled to Malaga needing just a draw to ensure the title, while Barcelona needed to defeat Eibar in the Camp Nou Stadium and to hope Madrid lost. However, Cristiano Ronaldo opened the scoring after just one minute and 40 seconds and despite the efforts of a Malaga side who gave everything, Karim Benzema doubled Madrid’s lead 10 minutes after the break. Keylor Navas produced fine saves to deny Sandro and Chori Castro and the celebrations commenced on the final whistle. Barcelona fulfilled their side of the bargain by defeating Eibar 4-2, but only after Takashi Iunu had put the visitors 2-0 ahead on the Camp Nou. In the end a Luis Suarez goal, an own goal and two late strikes from Leo Messi, one of which came after a wrongly given penalty, gave Barcelona a win which ultimately was in vain. The battle to qualify for the Europa League went down to the last minute when Juanmi’s header gave Real Sociedad a 2-2 draw away to Celta Vigo to assure they finished in sixth place ahead of Athletic Club Bilbao. Villarreal finished fifth after a 3-1 win away to Valencia thanks to goals from Roberto Soldado, Manu Trigueros and Nicola Sansone. Villarreal depended on themselves from the start of the day, and after Soldado opened the scoring inside the first minute they rarely looked as if they were going to struggle, despite Nani briefly levelling the scores with a second half header. Trigueros quickly put Villarreal back in front and with Valencia fans leaving the stands Sansone assured Villarreal’s win. Athletic Club Bilbao were victims of the last ever league game in the Vicente Calderon as they lost 3-1 to Atletico Madrid, who led 2-0 after just 11 minutes thanks to two goals from Fernando Torres. Inaki Williams gave Athletic, who needed to match Real Sociedad’s result to assure a sixth place finish, hope, but Angel Correa finished off a counter-attack to give the Calderon a fitting send off. Real Sociedad knew they had to go one better than Athletic to finish sixth and twice fell behind to Celta Vigo, as the Galician side looked to give coach Eduardo Berizzo a fitting send off. The game looked to be up for ‘La Real’ when Andrew Hjulsager put Celta 2-1 up in the 90th minute, but Juanmi’s 94th minute header saw Real Sociedad into Europe, while Athletic will still qualify if Barcelona beat Alaves in next weekend’s Cup final.